Have had this 98 D21 2WD pickup since Dec of 2017, getting horrible gas millage, owned a 1977 620 2WD, and a 1983 720 4x4, always got at least 20 mpg regardless of how i drove them. Any suggestions? I am getting an intermittent 0400 DTC, EGR system. Haven't removed the steel tube coming from the exhaust manifold yet, to check for blockages. have been following the diagnostic test procedures from my manual. but there are so many for this system. Typo? 1997, not a 1998. +1 - Incorrect timing will mess up a lot. The link above gives lots of information about Code P0400, and one of the symptoms it lists is poor fuel economy. You might want to read through it, but that entire article assumes your timing is correct. So, check timing first! Next, pull off the top hose to the EGR, and rev your engine quickly. You should feel vacuum at the hose end momentarily. If there's vacuum, then the EGR valve is bad. Can you compress the EGR diaphragm manually with the engine idling? Either slow or fast application of gas pedal should cause vacuum to draw diaphragm. If your friend gasses the truck fast the diaphragm compresses quickly and it is easy to feel it moving. This should cause the engine to start to die if everything is working properly. 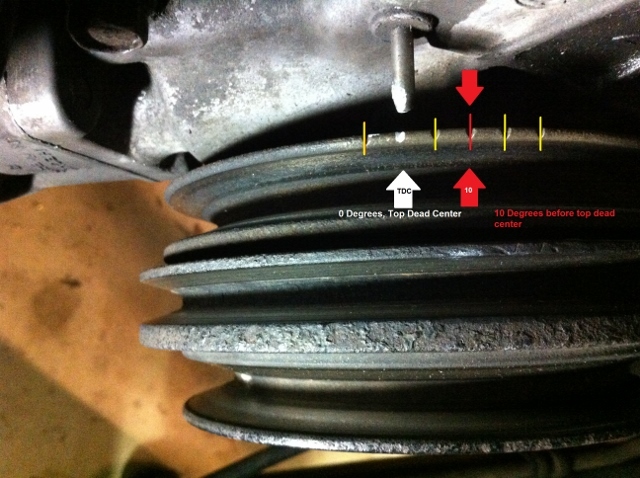 If the EGR diaphragm is not compressing when someone else pops the gas there is still a problem. The engine will run hotter without EGR function and the Nitrogen emissions will go up causing you to fail emissions. thanks for all your help, ya the production date was 08/97 maybe that is where I got the 8 from. went out and bought a timing light tonight. My manual speaks of adjusting timing with the Nissan "consult" scan tool, or a gst (generic scan tool) but also shows timing marks on the crank pulley and a pointed plate attached to the block. I just spent about an hour trying to find them, I did not crawl underneath, but I have never seen a degree plate under the crank pulley. from any angle up top you can barley even see the crank pulley, the water pump is directly on top of it, and the 3 belts do a pretty good job of hiding everything else. Are you suggesting using a light or scan tool to adjust timing? I will pull of the top hose on the EGR tomorrow and check for vacuum. Now when trying to feel movement of the EGR valve, are you feeling it from below, or does that button on top move? some of the illustrations in my manual seem to depict vapor coming out of the EGR valve. I have checked the coolant temp sens on the harness side, gnd is good and voltage is to spec., but I have not tested the senser itself. Thats on tomorrows list too. Use a timing light. Get the truck warmed up to operating temperature. Remove the air cleaner tube that runs across the front. You might want to remove a couple belts to free up some more space. The timing marks are on the crank pulley. The reference for them is a metal pin sticking straight out of the front of the timing cover. The marks on the crank pulley are as follows: 5,0,5,10,15,20. The red mark in the picture is 10 degrees btdc and that’s where you want it set. Disconnect the TPS from the throttle body. Loosen the 2 bolts on the distributor. Crank it up and see where it’s flashing. Turn the distributor to adjust the timing of the spark. If you can’t turn it far enough to get it to 10 degrees you’ll have to remove and reinstall the oil pump/distributor drive spindle. We’ll get into that only if you can’t get the spark to fire at 10. Now when trying to feel movement of the EGR valve, are you feeling it from below, or does that button on top move? 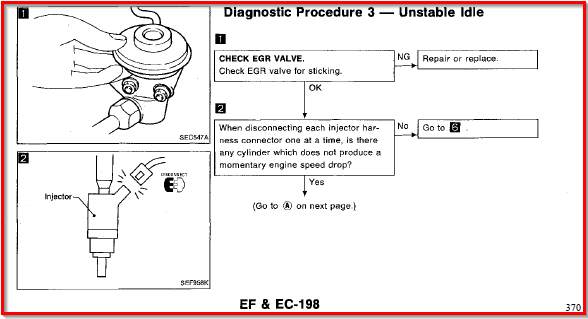 some of the illustrations in my manual seem to depict vapor coming out of the EGR valve. The rubber diaphragm underneath should push in and pop back out when you release. Thanks for your detailed answer, and great illustration, I appreciate the time you have taken to help me. It sure is nice having "friends in low places", Roll Tide. will let you know how things work out. I will try again, the first time I was a little cautious about getting my finger pinched. I need to get back on this mileage issue, been raining so much here in Florida, and I don't have a covered area to work under. Anyway, on the subject of ignition timing adjustment, is the distributor rotated clockwise to advance timing? I can see that the bolt on the dist. is all the way to the end of the adjusting slot(no more clockwise adjustment left). I can’t remember which way you turn it, but while you’re turning it you’ll know if it’s heading in the right direction.